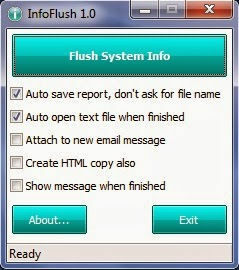 InfoFlush is a tool that will produce a text document filled with loads of system information from your computer. This information can be useful to provide when you are trying to have your computer repaired and you are asked technical questions about your system. There is a lot of data that will be dumped to the output file, such as the current OS type, computer name and username, hardware details (regarding the base board, CPU, RAM, mouse and monitor), as well as more specific details like screensaver delay, DirectX version or wallpaper style. Moreover, the generated report also specifies the full path for the most common Windows locations, such as Temp, Desktop, Cookies,Fonts, History, Templates, SendTo or Recent.